The snow is gone, and that means it’s time to start making improvements down at camp! 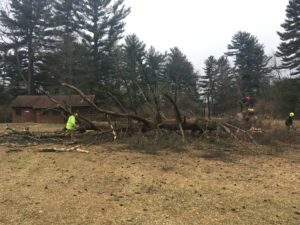 This week, we began our cleanup of the property by removing massive pines (a white pine and an Austrian pine) from the property. Both trees were dead and beginning to rot away. 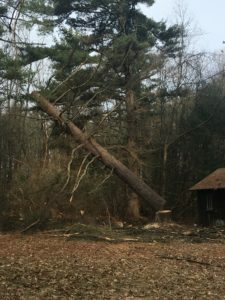 The Austrian pine was in the middle of the field, but the white pine was in a tough spot tucked between a cabin and a shed. 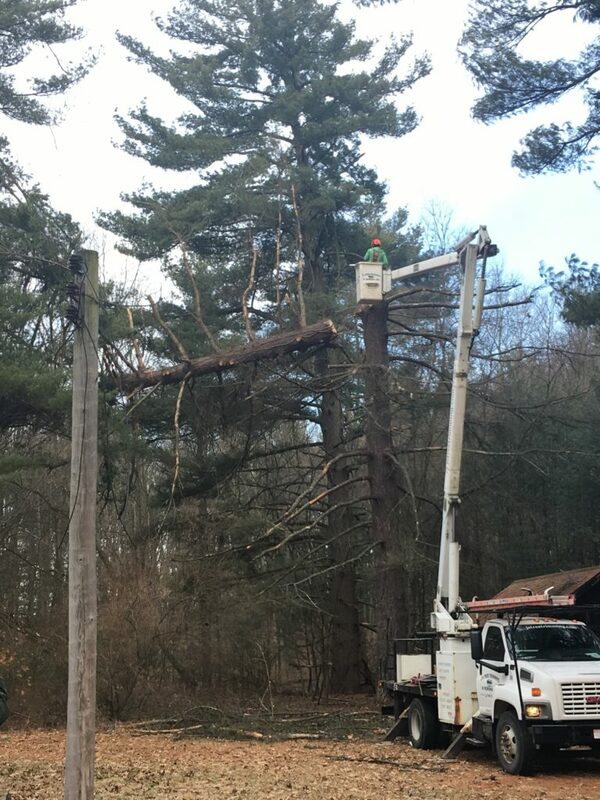 The white pine had started to lose branches, and they were falling all around the shed so we knew it was time to get rid of them. We called in a crew of professionals (J’s Tree Trimming and Removal Inc.) to come and help us out, and they did a great job taking down the trees. After all the work was done, they came up to me and told me how much fun they had. Apparently, they don’t get to work on trees like ours everyday. The top of white pine was extremely large and tricky, but they took it down no problem. They said the Austrian pine had such a massive base that they were not quite sure how they were going to take it down. But they got that one down with ease. It looks like we will have plenty of firewood this summer and probably many summers to come! There is still a lot of work to be done, down at the Cedar Lake Outdoor Center. If you are interested in coming and helping out, we are having a cleanup day on May 3, where volunteers and staff come to camp to help us get ready for the summer. We also provide lunch to all our volunteers! If you are interested in helping out, shoot me an email at mbass@mucc.org. Camp registration is still going on and we are almost 50 percent full! If you know of someone that would love going to camp, get them registered online here: http://app.campdoc.com/register/mucc. Make sure to register your camper before we run out of spots! If you know someone that would love camp but might be a little too old to attend, we are still looking to hire summer camp staff! We are looking for conservation educators/counselors, a waterfront director and a facilities manager. If you know someone that might be interested have them, check out our staff page: http://www.mucccamp.org/about/staff/ and submit an application.